It was just a tiny little nightstand that sat by my daughter's bed side throughout her childhood. It was plain and barely noticed, but it did it's job of holding up her lamp and her making sure she had a place to set her glass of water at night. It was a trustworthy little nightstand too, because it securely hid daughter's diary and tiara in it's little drawer. Throughout the years the little stand held up it's weight in treasures, and as daughter grew, it's purpose was sometimes overlooked as it eventually became just a little holder of piled whatnots. The little stand did it's best to hold up all the mounds of this-es and that-ses, but over the years it became weary and dingy, and bursting at the seams. One day, when daughter was all grown up and decided to move to a home of her own, the little nightstand was not even noticed and was left behind. It knew daughter would come back for it one day. It had been a good little nightstand, after all - but daughter had no use for such a sad-looking little stand. Daughter's mother (that would be me) noticed the little stand hiding in the corner of daughter's old room, and many times meant to throw it away, but somehow always forgot. Years went past and the little stand became very good at hiding so that daughter's mother would not make it leave. 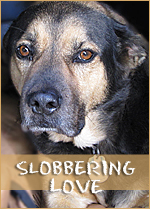 One day, daughter's mother had new plans for the stand's room and said, "Everything must go!" Taking a good look at the sad little stand, she decided to see if some paint might bring it back to life. As she was giving it a new white coat, she thought, "You need some color, little stand." She then had an idea to give the little stand some feet. Oh, they were nice! 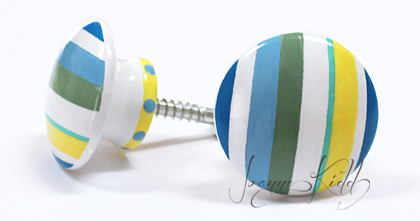 Then daughter's mother decided to paint a shiny new knob for the little stand's drawer. The little stand was coming back to life! The little stand soon looked better than new! Looking so cute and perky now, the little stand found a new home in daughter's mother's grandbaby's room in mother's house. It looked around and realized that it matched the other things in the room, and knew once again that it had a very special purpose! It held books and a picture, and this made the little stand so happy! This made the daughter's mother very happy too! Give a Girl a Spiffy New Camera, a Little Paint, and Some Wooden Knobs... and What Does She Do? 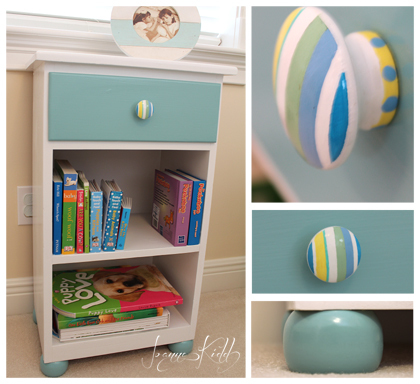 When giving the little nightstand (above) a new look, I knew it needed a decoratively painted draw knob, so I thought it would be fun to "re-invent the wheel" and make my own. This was a fun project, but took some time and patience (with a little bit of trial and error). So, what's a girl with a camera, some paint, and in need of a decoratively painted drawer knob going to do on a rainy day? Well, of course, I'm going to make a "how to" tutorial! You can usually find the unfinished wooden knobs at one of the big name hardware stores for about $1.00 each. The screw is included in the packet. 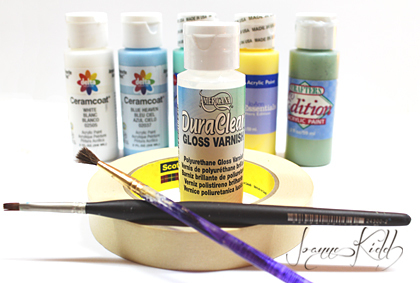 Other items needed: Acrylic paints, various sizes of artist paint brushes, masking tape, DuraGloss gloss varnish, some patience, and a steady hand. Step Three: Using two strips of masking tape, place them across the top of your knob, leaving open the strip you intend to paint. Don't forget to press the tape down to make a tight seal, and make sure it's also tightly sealed where these strips meet the tape skirt. Some colors take two coats of paint, and other require three. Just be sure each coat of paint is completely dried before re-coating and/or removing any tape. Remove stripe-guide tape and with new pieces of tape repeat step three for each stripe you paint. After all the stripes have been painted, remove the masking tape skirt and touch up any spots that may have bled. As an option, you can paint an accent around the bottom rim of the knob, if it has one. I painted mine yellow. For the dots. I used the bottom end of a paint brush dipped in the paint from inside the top of the bottle, then repeated when they were dry so that the dots would have dimension. You need to protect the paint with an overall finish. You can go satin or gloss it up. 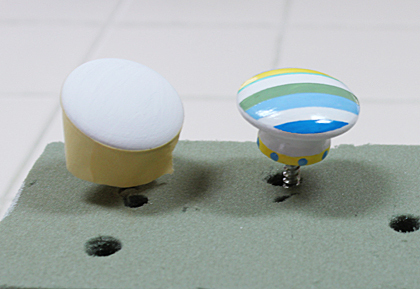 To give my painted knobs shine and a glass-like look, I used three coats of DuraClear gloss varnish. You can find this at JoAnn Fabrics or a craft store. These are two more I made to replace the knobs on the white bi-fold closet doors in the same room the night stand is in. Why are you still sitting there? Go make some knobs.... You can do it!